With the New Year approaching, it seems everyone is reflecting on their year and habits and making healthy resolutions – which is awesome, as long as healthy is also realistic. Salads seem to be a big part of those goals each year. This Tomato Caesar Salad helps you achieve your healthy eating goals in a delicious and sustainable way. I don’t know about you, but I’m way more likely to stick to eating healthy when that also involves eating delicious (and easy to prepare) food. There are plenty of health foods and good-for-you salads out there that don’t quite measure up in the taste department, and while I might suffer through them once or twice, I need to actually be able to enjoy my food in order for the recipe (or habit) to stick. While this salad dressing is made from scratch and involves an initial time investment, this recipe makes enough for several salads so you can enjoy that initial effort many times over. 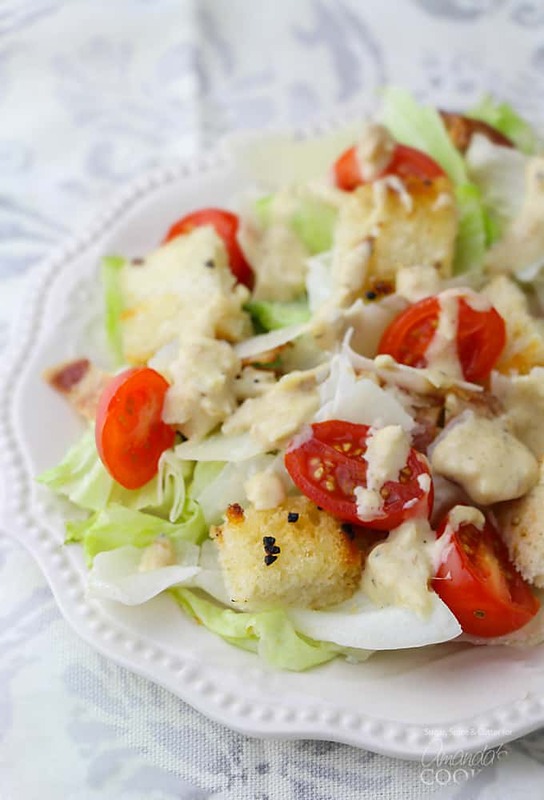 The homemade caesar dressing is a perfect blend of salty-umami-creamy that is nothing short of restaurant quality, while avoiding a lot of the junk that makes its way into commercial dressings. If you’d prefer mayo-free, I’ve previously made a simple olive-oil based caesar dressing but if you’re looking for something creamy, this recipe is the one you want. I also enjoy adding a poached egg on top of my salads to add creaminess and protein, like with this Sunshine Bowl. We also made homemade croutons for this salad, which isn’t essential but will definitely make for a better salad. 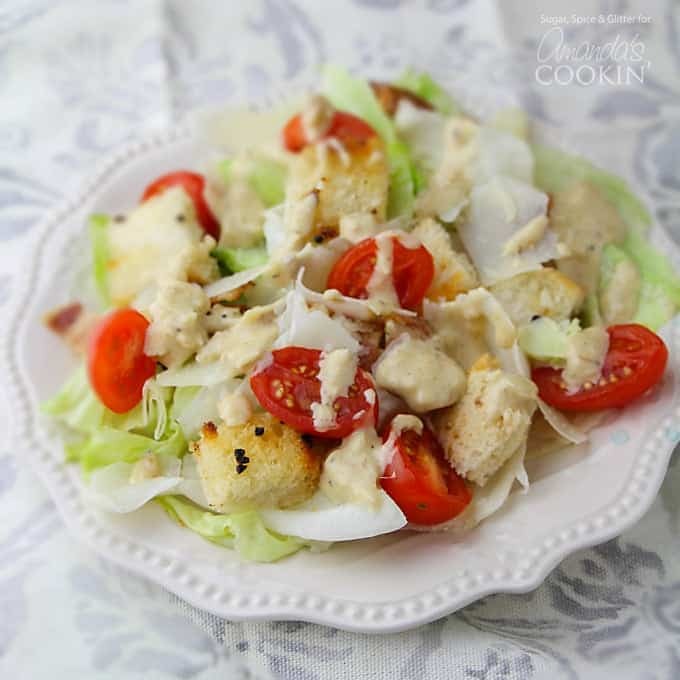 If you’re looking for a delicious salad that keeps you happily on your healthy eating path, this one will help you enjoy all of the flavor of a Caesar Salad with none of the junk! Be sure to measure out your dressing so you don’t overdo it. You might also want to try this Pomegranate Clementine Spinach Salad and this homemade Buttermilk Ranch Dressing recipe. Brush 1 Tablespoons of olive oil on each side of the crusty bread (total of 4 Tablespoons) and then sprinkle on 1 minced clove of garlic. Toast the bread in a frying pan set over medium heat, about 2-3 minutes per side. Remove from frying pan and add in the bacon, heat until fully cooked. Meanwhile, combine 6 Tablespoons of the olive oil, the mayonnaise, 2 minced garlic cloves, anchovies, lemon juice, mustard, Worcestershire, and half of the Parmesan. Taste and season with salt and pepper before adjusting the other ingredients. 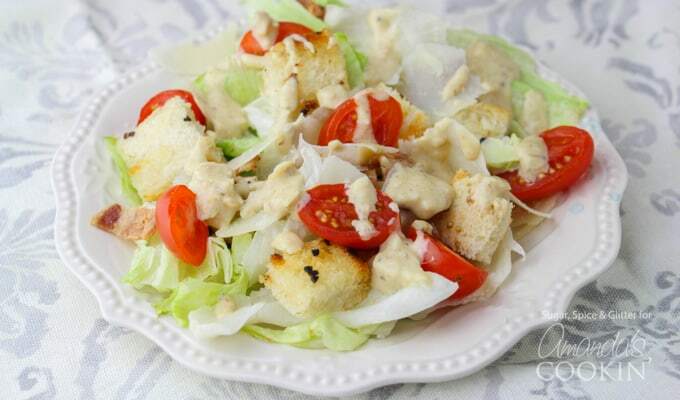 Let the dressing flavors meddle as you tear and wash the lettuce, and cut up the cherry tomatoes. Place all salad components except the dressing in a large bowl and toss. Add as much dressing to cover the salad, or drizzle on top of the portioned out salad. Save the remainder of the dressing for future salads.